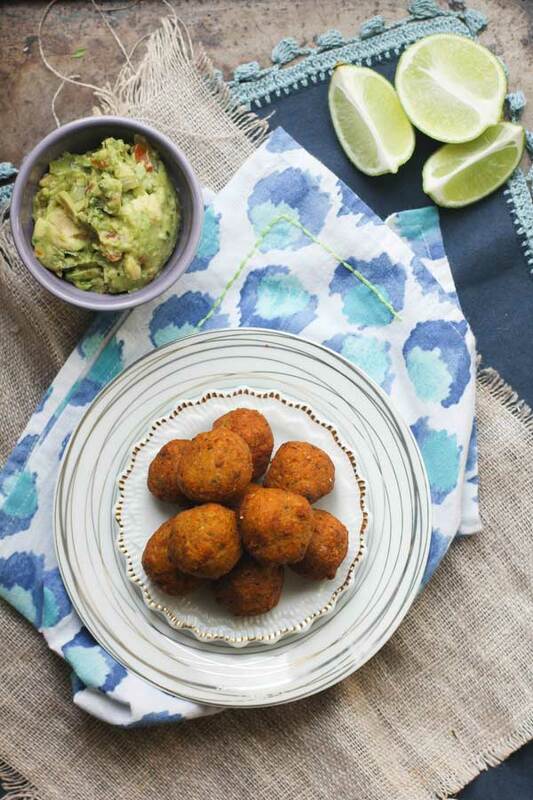 Vegan Sweet Potato and Millet Falafel Recipe from Oh My Veggies! I have a confession: I have an absolute obsession with falafel. I am always dreaming up new ways to make it for my family on those special nights when we indulge ourselves and this sweet potato and millet version is my newest flavor combination. If you have ever ordered authentic falafel at a Mediterranean restaurant then you know that it’s crisp and golden on the outside while the inside stays nice and tender. The secret to achieving this texture at home is by using dried, not canned, chickpeas. A batch of falafel like this one is simple to pull together and cook, but there is some advance preparation that has to happen. First, the chickpeas have to soak for 24 hours to get all nice and tender. You won’t actually be cooking them, so the soaking process is really important. This recipe also calls for mashed sweet potato and cooked millet. If you aren’t familiar with millet, it’s a tiny grain that is mildly sweet and nutty. It is incredibly versatile and has pretty much replaced couscous for us since we went gluten-free. Millet cooks up a lot like rice; I toast mine first and then add broth or water (2 cups of liquid for every 1 cup of millet), salt, and a little butter or Earth Balance. Then you bring it to a boil, reduce the heat and simmer covered for 15-18 minutes until the liquid is absorbed. Since it triples in volume after cooking, for this falafel recipe, you’ll start with about 1/3 cup dry millet. It may seem like a lot of effort, but trust me it is so worth it when you bite down into that beautiful golden falafel! I serve ours with hummus, guacamole, and tzatziki for dipping, homemade gluten-free naan for wrapping, and grilled veggies. It really is a family favorite around here! Serve this Sweet Potato & Millet Falafel with pitas or flatbread, hummus, tzatziki, and veggies. We’ve tested it deep-fried, pan-fried, and baked and it’s delicious any way you make it! Place the chickpeas, sweet potato, onion, garlic, parsley, cilantro, coriander, salt, cumin, cayenne, and black pepper into the bowl of a food processor and alternate between pulsing and blending, stopping to scrape down the sides of the bowl occasionally, until all of the ingredients in the the falafel mixture are uniform in size, but still slightly grainy in texture. Transfer the mixture to a mixing bowl and fold in the cooked millet. Roll a small amount of the falafel mixture into a walnut sized ball or a small patty with your hands. It should hold together nicely and not fall apart. (If it seems too wet, sprinkle the mixture with a small amount of the chickpea flour, no more than a tablespoon at a time, and fold it in. Once texture is correct, sprinkle the baking soda over the falafel and stir the mixture until combined.) Repeat the shaping process with the rest of the falafel mixture and place the uncooked falafel on a large plate or baking sheet until ready to cook. Pour the grapeseed oil into a high-sided skillet or saucepan to a depth of 3 inches or high enough to cover the falafel. Place a thermometer into the oil and heat on medium-high until the temperature reaches 360°-375°F. While the oil is heating, place a flattened paper grocery bag onto a baking sheet and cover it with a few clean paper towels. This will help to collect the oil as it drains off of your falafel. When the oil is ready, fry a test falafel. The oil should bubble up and sizzle all around it. The falafel itself should stay together in one piece and not break apart at all. It should take 2-3 minutes to fry to a beautiful golden brown. If your falafel is not completely submerged flip and cook the other side until it’s nice and browned all over. Remove the cooked falafel from the oil and drain on the prepared baking sheet. Sprinkle with coarse salt while the falafel is still hot, if desired. Fry the remaining falafel in batches, being careful not to over-crowd the pan and drop the temperature of the oil. Shape your falafel into patties, not balls. Heat a large skillet over medium-high heat. Pour 2-3 tablespoons of grape seed oil in the skillet and swirl to coat. Place the falafel patties in the skillet and cook for 2-3 minutes on each side, until crispy and browned. Transfer to a paper towel-lined plate to absorb the excess oil and sprinkle with coarse salt, if desired. Shape your falafel into patties, not balls. Preheat the oven to 400ºF and spray a baking sheet with an oil mister filled with grapeseed oil. Place the falafel onto the baking sheet and spray the tops with additional oil; bake for about 25 minutes, flipping halfway through cooking time, or until golden brown on the outside. To soak the chickpeas: Place the chickpeas in a large bowl and fill with water to cover them to a depth of 3 inches. Cover the bowl with plastic wrap and leave on counter for 24 hours. The chickpeas will triple in size and absorb quite a bit of the water, so check a few times during soaking to see if you need to add more. Once the beans have soaked for 24 hours, drain and rinse well. Yummmmmm! This looks so good! 🙂 One question, the chickpeas aren’t supposed to be cooked? why is that? The chickpeas soak up enough water to tenderize during the soaking process. They can swell up to three times their original size. When you cook these in the oil they will be super crisp on the outside almost like you dredged them in flour and breadcrumbs, but without having to do that.Making it this way the falafel has a completely different, more firm texture than if you used cooked or canned beans which I find make falafel mushy. 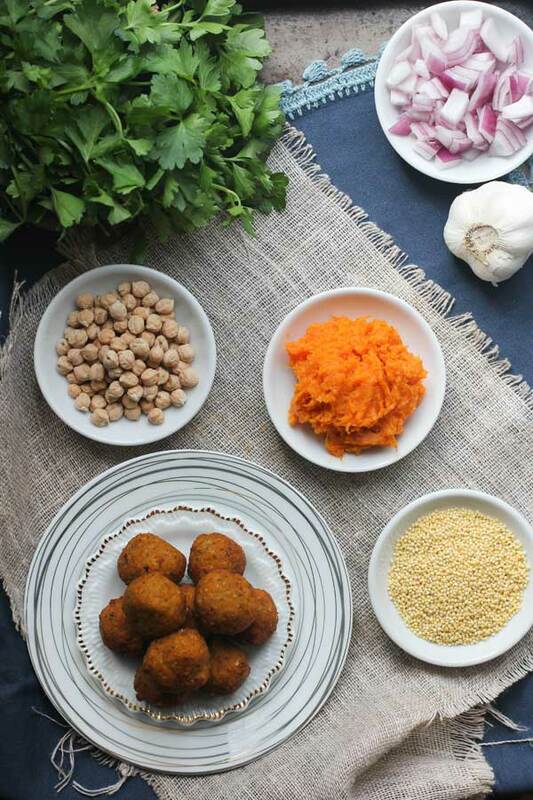 I’ve never had the chance to try falafel but always wanted to…these look delicious and I can’t wait to use millet in a recipe for the first time, too! Elisa, I think that you will find you love millet. When i first tried it I loved it so much that I was actually bummed that I waited so long to use it. I cook it at least once or twice a week now. I love falafel so much and only make it the traditional way, which is silly because I am living in a bubble…lol And thank you for mentioned to sue DRIED beans…it won’t work with canned. And LOVE the addition of sweet potato…my new addiction! Samantha, it is so hard to break from traditional falafel because they are just SO good!! I often branch out like this, but we definitely eat more traditional falafel than any other kind. I could eat the whole batch in one sitting. These sound fabulous! I adore falafel too! They’re so cute even my kids will eat them 😉 I’ll bet they’ll gobble these up with the sweet potatoes in them, fabulous idea! Pinned to make asap! These look wonderful! I love falafel too but have never made it at home. Thanks for sharing! I love falafel, too, but have always used cooked chickpeas to make it at home. This recipe looks very more-ish. Tell me the truth – which version tasted the best: the deep-fried, pan-fried or baked? Hold up. You don’t cook the chickpeas before using them?! Where has this concept been all my life! And to think, I thought I’d made falafel before…but OBVIOUSLY NOT. Ha ha! Joanne, you must try it this way it is a total falafel game changer. I’m adore falafel, and since Moaz is near me and makes them so wonderfully, I never make them. But Moaz doesn’t make sweet potato falafel, so now I have the perfect excuse to make them! Yuuuuuuum! What a fantastic idea! Different from the original but in a way I can really get on board with (admittedly I’m a purist when it comes to falafel, tabbouleh, hummus as I’m Middle Eastern). This is something I can certainly see making at home, and pan frying. Looks great and I can’t wait to try. Is it just me or is the millet missing from the instructions? Not just you! Millet is missing from the instructions, but since it looks like all the ingredients are tossed into the food processor together, that’s what I’ll be doing. Can’t wait to try this recipe! I have made felafel the traditional way on several occasions. Want to try with sweet potato. However, can Quinoa or cous cous be used instead of millet as I have any at this time? I am confidemt that quinoa will work and I am honestly completely unsure about how couscous would react since we are gluten free and I have not cooked with it in years. I think it would work. Thank you for your response! I was able to purchase some millet and made these today! Because I cook in stages many times, I assembled all of the ingredients last night processed and mixed as instructed and then put in fridge until this morning. This gave the spices time to marinate .Used a. small ice cream scoop to form balls and deep fried in my wok using peanut oil! Did not have to add flour or baking soda. They held very well! I also made fresh whole wheat pita bread and sesame tahini to top it with! This recipe is definately a winner and will be making it again! My family really enjoyed ESPECIALLY my sister who tries very hard to eat clean and gluten free! Made these tonight – pan fried in coconut oil. They were delicious! Thanks! Can these be made and frozen to eat later? what kind of flour you recommend secondarily to the chick pea flour? Whenever I buy it it ends up going to waste because I don’t use it enough. Meg – can you share your standard falafel recipe? I would like to try both!